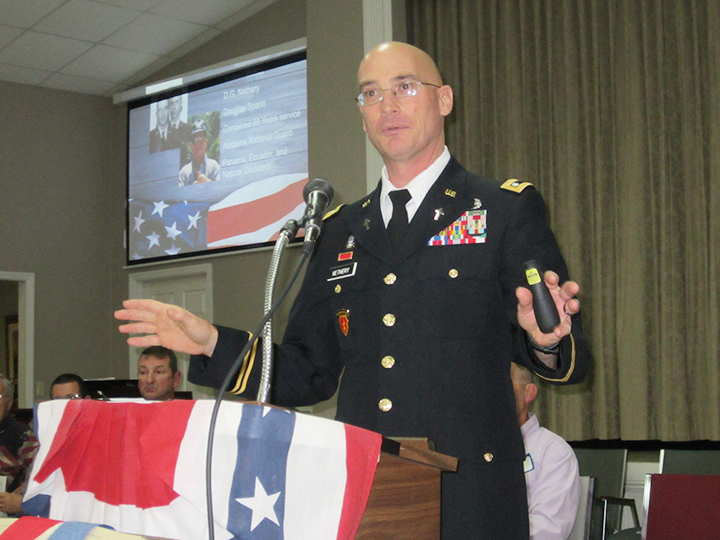 Mitch Nethery, chaplain and pastor at Haleyville FUMC, was the guest speaker at the ceremony. HALEYVILLE - A Veterans Day celebration was given in honor of veterans in the Slaughter Fellowship Hall at the First United Methodist Church on Monday, Nov. 5. The beginning of the ceremony started with the procession of 16 veterans from various wars. Presentation of colors were performed by Cub Scout Troop 97 of Haleyville. After pledges, the playing of the national anthem by the Haleyville High School band, and welcome by Mark Burleson, Aubrey Haynes gave an introduction of all veterans in attendance and their families. The band then gave an instrumental tribute of “Veteran’s Salute” to all military branches. Those veterans in attendance were Albert Rivera, Mark Wakefield, Jim Banks, Buford Thompson, Tim Williams, Scott Knight, Keith Blaylock, Edward Poolos, Mitchell Nethery, Thomas Gilbert, Hugh Plott, Kenneth Swims, Toby Yarbrough, Bryan Lawler, Wade Head and Dwight Thomas. Hugh Plott gave the introduction of speaker Mitch Nethery, Chaplain (Lieutenant Colonel) and also pastor at FUMC. “Why should Americans serve in the military?” asked Nethery. Because we are free, to protect those who are defenseless and because it is our duty were the answers he gave. Nethery continued to describe each war from World War I forward and how the U.S. entered each war. “We went over there and suffered and bled and died in one of the most brutal and bloody wars that has ever been on the face of this earth,” Nethery described of World War I. “Instead of shaking them to pieces, we shook them awake, and we awoke a sleeping giant,” Nethery spoke of Japan and the bombing at Pearl Harbor, which brought the U.S. into World War II. “(It’s not) a conflict. If you’re the one dug in, it’s war!” he said while speaking of the Korean War. “Why do we serve? I want to tell you why I serve. I serve because it’s a privilege to serve, and it’s an honor to serve. I serve because we have something worth serving. I serve because I’m an American. I don’t serve for any other reasons. I am a free American today. I got Dutch-Irish heritage. I don’t go around saying, ‘Hey, I’m Mitch Netherton. I’m Dutch-Irish.’ I come from Beaverton, Alabama. I’m not a Beaverton-American. I’m just an American, plain and simple,” Nethery said excitedly to the applause of those attending. “American Flourishes.” The band was led by Assistant Director Judd Williams. Veterans Day was Sunday, Nov. 11. Many businesses closed in observance of the holiday on Monday.